How did Bhima has Strength of Ten Thousand Elephants? Bhima, the second of Pandava brothers, was one of the strongest characters in the Hindu epic of Mahabharata. What made him outshine other characters was his immense strength which was capable enough of moving mountains. He was known for his ill temper and was the most violent of all the brothers. Born to Kunti through Vayu Deva, Bhim endorsed in himself the strength of ten thousand elephants. From how he slew the Kauravas in the Kurukshetra War to other stories of his enormous power we have heard it all. In fact, it is believed that there were five men in the world, who shared the same amount of strength. Out of these five, one was destined to kill the remaining four. These five were Bhima, Duryodhana, Jarasandha, Keechaka, and Bakasura. Fulfilling this prophecy, it was Bhima who killed the remaining four. But how did his strength got multiplied to that of 10,000 elephants is the question? Read further to get your answer. As Bhima was born unlike other newborns, he roared like a mighty tiger, a signal towards his immense ferociousness. As Kunti was carrying him, he slipped from her arms and fell off the hill. To her shock, Bhima not only outlived the dreadful fall but the boulder on which he landed got broken into pieces. This act assured his parents Kunti and Pandu that their son was no less than an extraordinary human who possessed supernatural strength. During his childhood days, Bhima was always seen at edges with Kauravas. Duryodhana and Bhima were like the poles apart. Sharing the equal strength as Bhima, Duryodhana envied his power. Shakuni tried his best to plant the seeds of enmity between the two. Where Bhima bullied the Kauravas with his jokes, Duryodhana’s temper reached towards an end where he decided to kill him. He turned towards his maternal uncle Shakuni for help who asked all the guards to leave his chamber so that both could have a private talk. He then tells Duryodhana that the Kingdom of Gandhar has always been famous for producing powerful poison. So, their evil scheme was to fed Bhima with that poison so that they could kill him. As Bhima was fond of eating, they planned to mix some of it in his food. Duryodhana faked his acceptance of Pandavas and on this happy occasion scheduled to have a feast. Pramankoti was the decided place where the eldest of Kaurava brothers executed his plan. He ordered his younger brothers to distract Pandavas so that he could mix poison in his Kheer. Bhima all tempted with sweetness agreed to eat it. As he drank all of it, he soon started to feel dizzy and unconscious. Duryodhana then tied his hands and threw him into the River Ganga. When the other Pandu brothers enquired about Bhima, Duryodhana told them that he has already returned to the palace. Meanwhile, Bhima regained consciousness and was shocked to see himself tied underwater. He sunk to the extent that he reached the Kingdom of Snakes where the snakes started biting him. At first, they bit his ropes and then his body except for his chest which was even harder than stone. Their poison acted as an antidote to the one which Duryodhana had mixed in his kheer. But misunderstanding their attempts to save him, he started to throw them away. 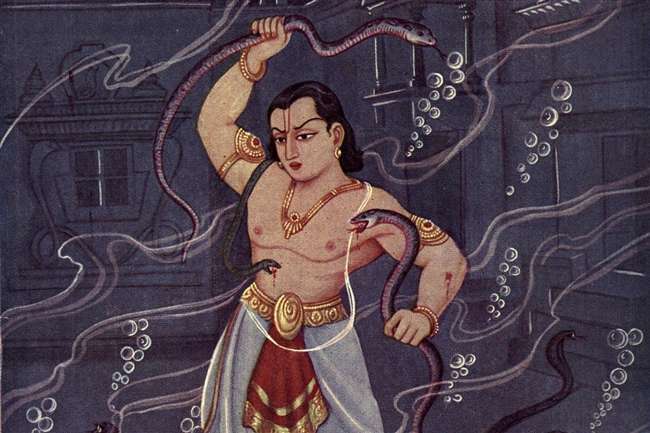 One of the snakes escaped and informed Vasuki about his arrival. Vasuki was aware of Bhima’s valour and that he was a Pandava. At the Naga court, he realised that it was for his betterment and one of the Nagas named Aryaka was Kunti’s great-grandfather. Moreover, Vasuki’s clan was an ancestral clan of Pandavas. Vasuki to help Bhima further gave him a potion to drink. The nectar not only saved his life but gave him the strength of ten thousand elephants. As soon as he drank it, he felt a sudden might and became the strongest. Therefore, Duryodhana’s attempt at bringing Bhima down, turned as a blessing for Bhima as now he had 10,000 times more power than prior.